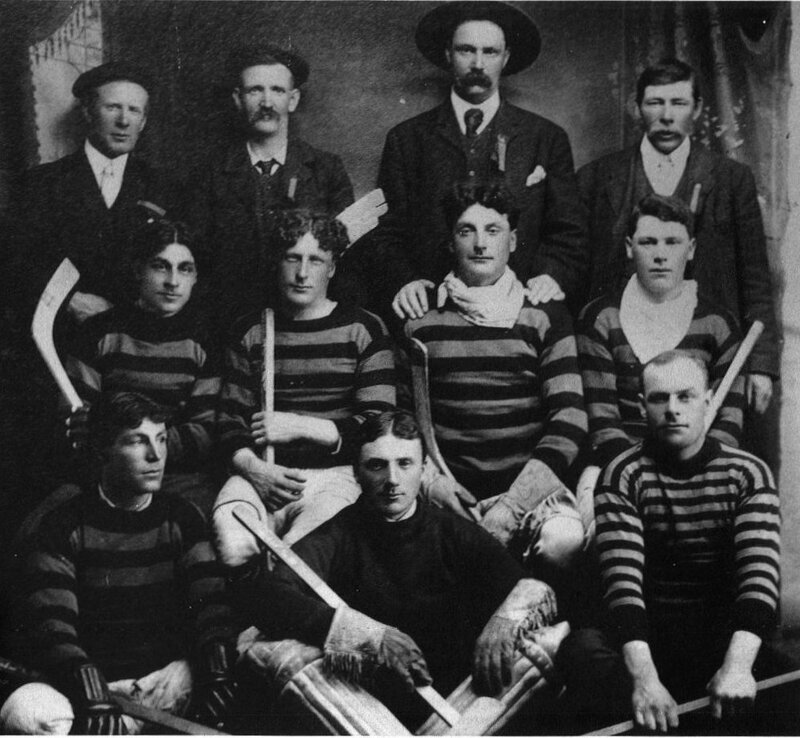 "A remarkable trip was made by the above Hockey team to Gilbert Plains in 1908. The game was arranged by Glen Campbell, MP of that town and Walter Scott of Elphinstone. The transportation which we had to secure was supplied by the late Henry Johnstone and an old war veteran, Jack Johnstone, who at present makes his home with Mr. and Mrs. Albert Spraggs. The teams were tandemed on one sleigh, and the Geekie brothers followed with a team and Jumper. We left at 9 a.m. on April 1, a beautiful moring. We stopped about a mile from Lake Audy to feed the horses and to eat. By this time the snow was becoming quite soft, and upon reaching the mountains, the water was really running. However, we kept going and landed at Glen Campbell's at about 5, where we had supper. Mr. Campbell supplied us with a team and a wagon and then we continued our trip to the Plains. We arrived early in the evening at the Hotel where we changed into our Hockey uniforms. We got a pleasant surprise in leaving the Hotel when we found the town band ready to march us to the Arena. 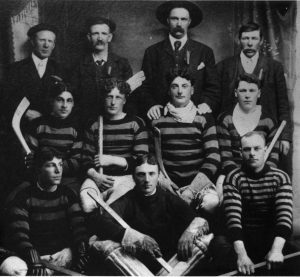 The game was played to a packed Arena and won by the opposition by a score of six to five. The next morning we had the above photo taken at a Chinaman's Studio. We left the same moring and arrived at Glen Campbell's at Dinner.